You now have access to the Futures Snow Awards and are able to sign up to any Futures events. 1) The best way to complete the Step 1 Award is to attend an official "Futures Snow Award" event. At this event a group of kids will be taken through all twenty tricks with a qualified coach or instructor. Check out all upcoming events here. 2) It is also possible to download everything online by clicking here. Simply work through the 20 tricks with a local instructor or with the help of an adult. Full instructions on how to complete your award are on the downloadable pack and all those that complete their Step 1 Award will end up in our Hall of Fame! These off-snow tricks can be done by anyone just about anywhere! However the on-snow part of this award is not for complete beginners.Step 1 is suitable for those who can easily control their speed, carry out turns and stop safely. If you would like to receive a paper version in the post please email info@futuresproject.co.uk with your name and address. Part 1 - Stand with your feet slightly wider than shoulder width apart, knees gently bent. Part 2 - Slowly shift from one side to the other increasing the pressure until you can lift one leg and balance on the other. Part 1 - With your arms at chest height, slowly lean forwards towards the wall and balance on your toes. Part 2 - Make sure that your weight is on your toes and that you’re only using the wall to balance. Part 3 - You can also see if you can very gently rock back onto your heels, raising your toes off the ground. Part 1 - With your feet wide apart, squat down by bending your knees. Part 2 - Now jump forwards and backwards over a line or small object. Part 3 - Do it 5 times forwards and backwards. Part 1 - As in Trick 3, squat and jump sideways over a line or small object. Part 2 - Do 5 x to the right and 5 x to the left. Part 1 - Stand tall and straight. Part 2 - Bend your knees and jump 90 degrees to the left. Part 3 - Now do the same but to the right. Part 1 - Just like in Trick 5, stand tall and straight. Part 2 - Bend your knees and jump 180 degrees round to the right so you are facing in the opposite direction. Part 3 - Now do the same to the left. Part 1 - Put one foot in front of the other and bend your knees. Part 2 - Place your hands on the floor, lower your shoulder to the floor and roll across to your opposite hip and stand up. Part 1 - Jump forwards and rotate 90 degrees. Part 2 - Make sure you land firmly and safely. Part 3 - Try again but now rotate the other way so you can do it both to the left and to the right. Part 1 - Jump forwards and rotate 180 degrees so you are facing the opposite direction. Part 3 - Jump forwards and rotate 180 degrees so you are facing the opposite direction. Part 1 - Bend your knees and place your hands on the floor in front of you. Part 2 - Now quickly jump your feet from left to right over a line or small object. Part 3 - Do 10 in a row back and forth without stopping! Part 1 - Start by riding straight down a gentle slope. Part 2 - Move your weight backwards along the ski or snowboard to lift the tips of your skis or snowboard. This is called a tail press. Part 3 - Also try it the other way around - try and lift the back of your skis or snowboard, this is called a nose press. Part 4 - Try and keep your balance before lowering back down. Part 1 - Ride in a straight line onto a small ride-on box. Part 2 - Try to keep your balance - don’t lean forwards or backwards too much. Part 3 - Ride off the end of the box. You’ve now done a 50/50! Part 2 - Try and lift both feet and knees to hop your snowboard or skis off the ground. Part 3 - Once you’ve got that, you can also try lifting your arms and shoulders at the same time as your feet to see if you can jump even higher. Part 2 - Lean back, lifting the front of the snowboard or skis off the snow - like you did in the straight press. Part 3 - Then straight away spring up and move your weight forward to get some air. Part 1 - Stand still with your snowboard or skis pointing across the hill. Part 2 - Jump 90 degrees so you are then pointing and moving down the hill. Now you are going to do the Jump 90 but backwards! This is called skiing or snowboarding “switch”. Part 2 - Jump 90 degrees so you are then pointing backwards and moving down the hill. You are going to do this one on the spot so make sure you are standing steady! Part 1 - Point your skis or snowboard across the slope. Part 2 - Make sure you are standing firmly. Now rotate or spin your body uphill, lifting both feet and spinning 180 degrees. Now we are going to do a 180 again but this time moving! Part 1 - Point your skis or snowboard across the slope and start moving forwards. Part 3 - You should now be facing the opposite way and moving backwards! Part 1 - Ski or snowboard around the obstacles on the slope. Use cones or any safe obstacle if training brushes are not available. 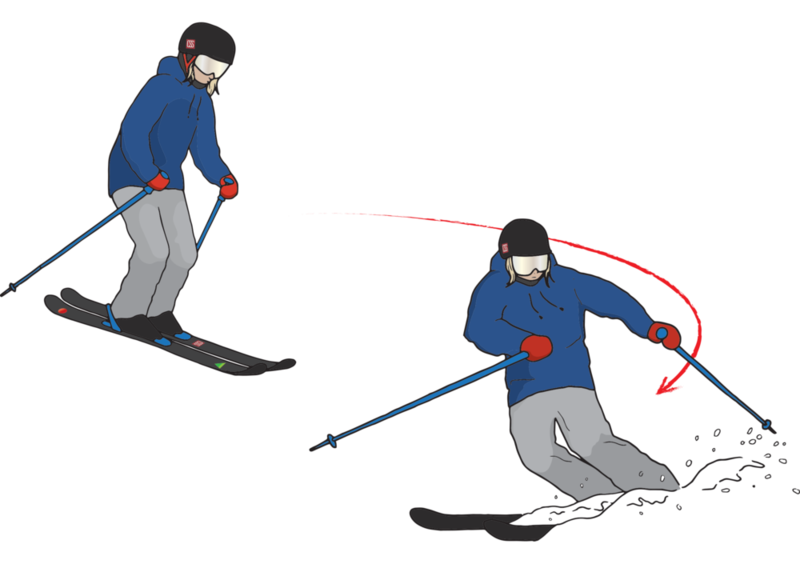 Part 2 - Turn your snowboard or skis across the slope into a side slip to come to a stop, just like they do in ice hockey.